This low-carb take on a classic Italian dish replaces pasta with zucchini noodles and uses milder broccoli florets in place of bitter broccoli rabe. 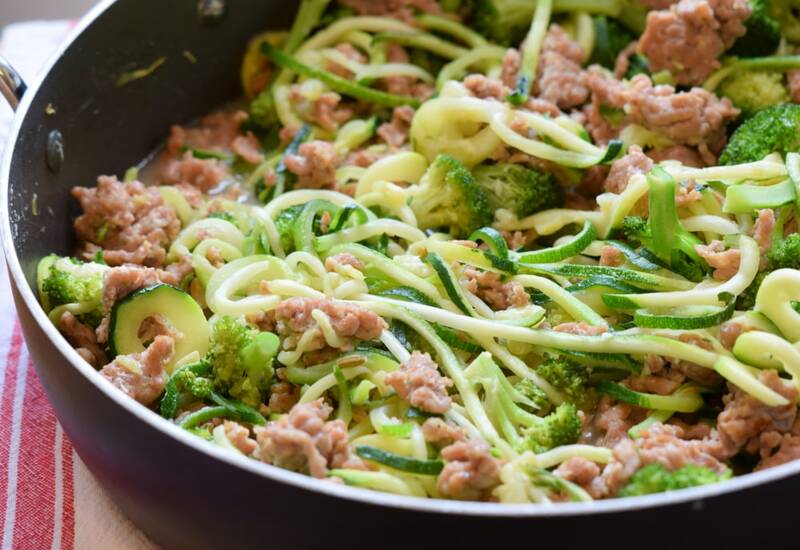 To make this quick dish even speedier, purchase bulk sausage, pre-cut broccoli florets, and prepared zoodles. Per Serving: 290 calories; 13g fat; 15.8g carbohydrates; 24g protein; 40mg cholesterol; 1058mg sodium. I added garlic and some red pepper flakes to this because it just seemed like the thing to do, and I think I was right. I love how this comes off as a stir-fry/pasta dish without the noodles or rice. I've been living off crock pot freezer meals all week and needed something fresh and satisfying for dinner tonight. This lovely dish fully satisfied! It's super easy to put together and there was minimal kitchen mess as well! I followed the directions to the t. Next time I make it I'll add a sprinkle of red pepper flakes to add some zing. I'd recommend salting and draining your zoodles before cooking if you want a less watery dish. Serve this with a side of garlic bread and enjoy! I added oregano and dried basil to this recipe, and used ground turkey instead of Italian sausage. This is one of my favorite recipes for weeknights. I used pre-cut broccoli florets and pre-spiralized zucchini from the store, quick and convenient. This recipe took no time at all to make, perfect for those days when you're running short on time but you're also hangry! I will never get enough of zoodles and meat. However, I decided to switch up this pairing just a bit and used chickpeas instead of sausage. I really love incorporating the broccoli in with the zucchini, double the amount of veggies and nutrition!